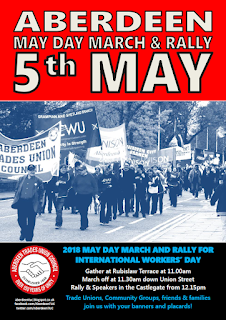 Aberdeen's May Day March & Rally for International Workers' Day will be held on Saturday 5th May this year. The event is organised as always by Aberdeen Trades Union Council. Each year, people across the globe take to the streets to commemorate International Workers' Day, or May Day. ATUC President, Kathleen Kennedy said, "In our 150th anniversary year we want to make our May Day March and Rally an event to remember. "We are calling on trade unions, community groups, friends and families to join us with banners and placards. "We want to give a clear message on International Workers Day that workers matter. We are the backbone of our society and should be treated with respect, decently paid and their workplaces should be safe, healthy and family friendly. "We shouldn't need to strike to defend our pensions, our pay and our terms and conditions - yet we do. Events like our May Day March show solidarity and support for our struggles." Please gather at Rubislaw Terrace at 11.00am, to march off at 11.30am down Union Street. A rally will be held in the Castlegate from 12.15pm, with a range of speakers from trade unions, local politicians and community activists.